Villa Azalea is for rent in Les Issambres (Côte d'Azur), only 2 km. from the beach and 3 km. from the village centre with shops and restaurants. This lovely holiday villa with heated pool was completely refurbished in 2017 and commands breath taking views of the bay of St. Tropez. Perfect holiday villa for 8 with WiFi internet, air conditioning and heated pool! Vacation villa Jacky is a lovely Provençal villa with a panoramic view across the village and the bay of St. Tropez. Charming vacation villa close to the beach (1500 m.) with 5 bedrooms, 4 bathrooms, air conditioning, WiFi internet, Jeu de boules court and a large heated pool with Jacuzzi! 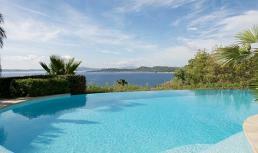 Villa Isabel is a magnificent, modern holiday villa in Les Issambres, only 2 km. from the beach. 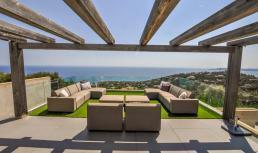 Extraordinary design villa with private pool, summer kitchen, air conditioning, WiFi internet and panoramic sea view! Villa Igone is a superb holiday villa in Les Issambres on the Côte d'Azur (France) within walking distance to the beach (330 m). 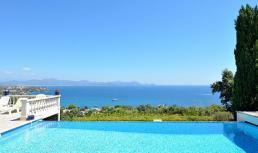 Wonderful holiday villa for 12 with 5 bedrooms, 5 bathrooms, air conditioning, WiFi internet, heated pool and breath taking sea view! 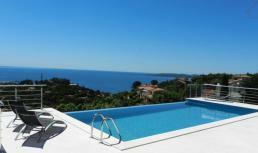 Villa Amber is located in Les Issambres on the Côte d'Azur (France) within walking distance to the beach (800 m). 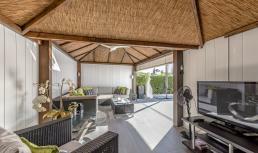 Wonderful, modern holiday villa for 10 with 5 bedrooms, 4 bathrooms, air conditioning, WiFi internet and heated pool! 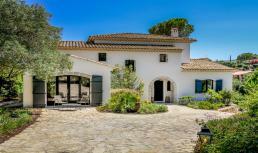 Villa Imogen is located in Les Issambres on the Côte d'Azur (France) within walking distance to the beach (500 m). Wonderful, modern holiday villa for 10 with 5 bedrooms, 4 bathrooms, air conditioning, WiFi internet and private pool and breath taking view across the bay of St. Tropez! Holiday home Marcella is located in Les Issambres on the Côte d'Azur (France) within walking distance to the beach (250 m). Wonderful Provençal style holiday home for 4 with 2 bedrooms, 1 bathroom, WiFi internet, private pool and beautiful sea view!